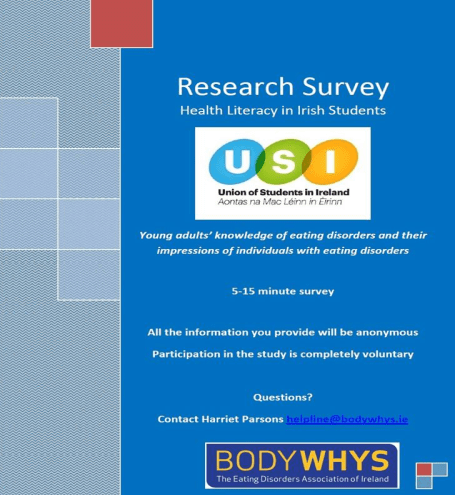 USI is supporting a new Bodywhys survey which looks at young adults’ knowledge about the various categories of eating disorders and their impressions of individuals with eating disorders. The survey will take 5-15 mins and there are a number of surveys depending on what college you are attending. There are no known or anticipated risks associated with participation in this study. However if you are affected by any of the issues raised in the survey you can contact Bodywhys support services on 1890 200 444 or by emailing alex@bodywhys.ie or you can contact your Student Union Welfare Officer.